Cotton is one of the most important fiber and cash crop of the world. Pakistan is the 3rd largest exporter of raw cotton and a leading exporter of yarn in the world; contributes nearly 10 percent in the agriculture GDP and is a source of 60 percent foreign exchange earnings. The value addition through cotton is 8.2 percent in agriculture and 2 percent in the GDP. Sindh and Punjab are the ancient homes of cultivated cotton. It is considered white gold of Pakistan. The area under cultivation and production is about 3192 thousand hectares and 14265 thousand bales, respectively with 760 kg/hectare yield. The crop has maximum area in Punjab followed by Sindh and very negligible in NWFP. The yield per hectare of seed cotton in Punjab is more to that of Sindh province. 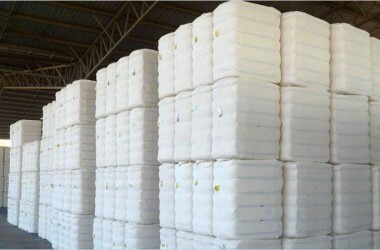 Cotton crop is totally useful for human beings and animals from seed to waste, basically is a natural fiber that finds use in many products, range from clothing to home furnishing and producing medical products; as a result, it is always in demand though its use is subject to the strengths and weaknesses of the overall economy. Cotton feeds 1035 ginners and about 5000 oil expelling units, which produce 4.00 million tons edible oils. In such a way, cotton brings cash return to farmers, supply raw material to textile industry and provides employment to thousands workers, both in rural and urban areas. About two third of the harvested crop is composed of the seed which is crushed to separate its three products oil, meal and hull. Cotton seed oil is a common component of many food items, used primarily as cooking oil. The oil is used extensively in the preparation of snacks food and crackers, cookies and chips. The meal and hull are used as feed for live stock, poultry and fish. Cotton waste, meal and hull also used as fertilizer for improving soil fertility. Cotton waste is also multiuse product used for mulching in crops, substrate for artificial cultivation of edible and medicinal mushrooms. However, the productivity rate of cotton for Pakistan did not depart significantly from the world average (1,576 kg/ha) over the period, because of many reasons, including diseases, caused by fungi, bacteria, nematodes, viruses and physiological disorders. Lyda and Watkins (2001, www.apsnet.org) listed 3 bacterial, 17 fungal, 4 plant parasitic nematodes, 10 viral and 2 phytoplasmal and spiroplasmal diseases in world. The work carried out so far in Pakistan shows that seedling rot or wilt, root rot, boll rot, anthracnose, different types of leaf spot diseases, premature opening of bolls (Tirak), stunting and reduction in size of leaves, some nematode species, bacterial blight (angular leaf spot and boll rot), leaf curl and stenosis of cotton, found causing damage to the crop. These diseases are injurious in some areas, in some years and on some plant parts. The magnitude of disease damage depends up on the environment and cultivar. In spite of all, cotton wilt disease is the most dangerous, causes sudden death of plants and results monetary losses after infection; therefore in severely affected areas it may cause whole fields to be ploughed out. Several species of Fusarium and Verticillium fungi causes wilt. Both the fungi differ from one another, but cause very similar symptoms. The only reliable method for separating and identifying these diseases is taxonomy of causal fungi, both can be readily isolated and cultured from the diseased plant portions. Both the fungal wilts thrive with high nitrogen fertilizer, excessive soil moisture, thin stands and deep cultivation. Both the fungi survive for long periods (for at least a decade) in soil on organic matter and even on non-host plants. However, some of the differential general characteristics between both the wilt fungi may also help in identification and control. Fusarium wilt develops well in acid soils, is more prevalent in sandy soil, causes more injury when the nematodes injure the roots, can be transmitted internally in seed and prefers hotter soil than Verticillium. Whereas, Verticillium wilt thrives in alkaline soil; is more prevalent in heavy soils, does not require injury for infection, can not be transmitted internally in seed and prefers cooler soil than Fusarium. The wilts start appearance at seedling in case of early attack and/or may also occur at any plant growth stage. Areas of reduced or patchy plant stand can be seen in affected fields, usually spreading in the direction of irrigation flows. Symptoms include seed and seedling rot, wilting, death of seedling and adult plants, accompanied by vascular browning. Initially, vein clearing and leaves show a distinct loss of turgor and yellowing occurs starting at the leaf margin between the main veins, sometimes referred as leaf epinasty, followed by stunting. The stunted plants may fruit early.The yellowing progresses inward and is followed by necrosis hence defoliation occurs starting at the bottom of the plant, and consecutively towards the top, results progressive wilting of leaves and stem, defoliation and finally death of the plant (partially or wholly), some attempted regrowth. The diseased plants are pulled out easily, due to the loss of rigidity. Brown, red or yellow rings of discolored tissue observed in case of cutting the stem in crossways, mostly close to the base and plant death occur in severe cases. Fusarium wilt is a solid dark brown ring compacted with healthy white stems around the outer portion of the stem and that the infected areas observed irregular in shape and size. Water-conducting stem tissues turn brown and become inactive, resulting in wilted foliage. Leaves turn yellow between veins and eventually shed as plants die to leave bare stems. Once the fungus has colonized the plant the diagnosis is confirmed by splitting the stem to reveal dark brown, vascular discoloration and streaking characteristic of wilt, most likely causes the death of the host. The wilt diseases mostly spread in patches, but entire field may also be affected in severe conditions. Certain strains of the causal fungus only cause symptoms when plants are also infected with the root knot nematode. In those cases, galls are usually prevalent on lateral roots. Some formae speciales are not primarily vascular pathogens but Fusarium spp. may also cause foot and root rot or bulb rot in cotton. Cotton wilt causing both pathogenic fungi (Fusarium and Verticillium spp.) are seed-borne, may carry over for long-distance, spread from year to year by sowing infected seed; also move from field to field, farm to farm and region to region, whenever very small quantities of infested soil is transported through boots, farm equipments, vehicles, in water (irrigation and overland flows), in flood irrigation and also in infected plant material, including seed etc. The fungi sustains on the outer surface of roots of many crops and weeds and survives indefinitely in soil for at least a decade, even in the absence of cotton plants. The diseased plant debris lying in the field or in the storage space also helps both the fungi to remain alive. The cotton husks, used as cattle feed are also identified as a potential source for spread of wilt. The scientists also reported very broad host range of both the wilt causing fungi, at the species level. More than 120 different formae speciales have been identified based on specificity to host species belonging to a wide range of plant families. Prevention is better than cure, because control of wilt diseases is very difficult, chemical control is very costly and even is impossible to recover heavily infected, shriveled and damaged plants. However, cultivation of resistant variety is only the most easy, economical and safe method. Growers are advised to plant improved immune or resistant varieties, because these are equal to the susceptible varieties in yield, adaptation and other cultural characteristics and field practices; since new races of the fungi may develop and attack on these. However, it is necessary that growers must keep in touch with the latest information on resistant varieties and control measures. The following preventive measures also help to minimize risk of damage.• Crop rotation with non host crop is preferably recommended, because lower disease intensity has been reported in case to avoid cultivation of susceptible varieties/cultivars in the diseased area at least for three years. • Clean cultivation by removing infested plant materials after harvesting through deep and repeatedly tillage operations help to destroy infected plant parts from field. • Good drainage improves soil conditions which help to minimize the disease incidence. • Use of disease free and certified seed or seed treatment with suitable seed dressing fungicides before sowing is also recommended. • In some cases, late and deep sowing reduces disease incidence. • Mixed cropping with non host crops also help to check the disease. • 5-6 weeks mulching with colorless plastic is recommended for soil solarization and straw mulch help to maintain temperature for reducing the fungal population in crop field. • Uprooting and burning of diseased plants and weeds help to minimize further spread of the problem. • Proper irrigation and balanced fertilizer application help to grow healthy plants with the aim of more resistance against wilt and other diseases. • Avoid storage of plant waste material and even storage in the field, otherwise sweeping the waste material from storage space and burning or burying all plant debris must be ensured.